I’ve been busy lately crocheting more hats for the Warmth for Warriors group. One of my on-line group friends crocheted a cute hat using a ribbed stitch style that I really liked. After some help from Ellen, I finally got the pattern created. Below is the written crochet hat pattern that I created featuring the ribbed band that was inspired by Ellen from our Ravelry group. The two-toned wool hat is my favorite using the crochet pattern so far. I used the pattern below and at round 7 switched from the olive green to the oatmeal colored wool yarn. Then you alternate every other round in the two colors ending at round 20 with the olive green yarn. I carried the yarn not in use behind by just dropping it at my joining slip stitch. When you come back around you just pick up the dropped color at the slip stitch. At row 21, I began the ribbing with the olive green wool. Make sure you use the same color in round 20 that you use for the ribbing so the first round of ribbing matches that you are working the front and back posts around. Here is another version of the ribbed hat and in an extra large size. 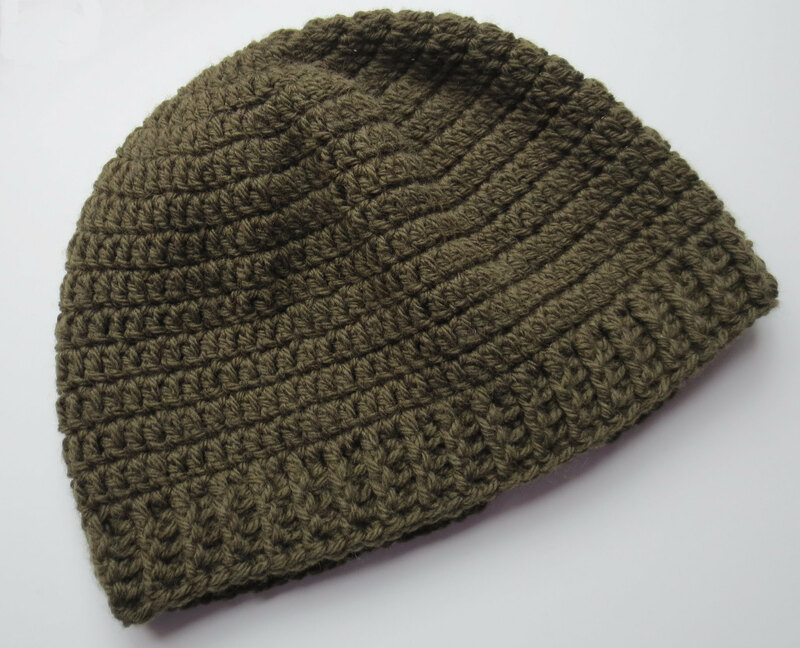 This one is crocheted all in one color and was designed more as a helmet cap to fit under a soldier’s helmet. I started with 16 double crochet (Dc) stitches and only went to round 15 following my original crocheted helmet hat pattern. I then added the ribbing rounds to complete the hat. It measures 23″ for a circumference and is 8-1/2 inches long. As you can see you can change up the pattern’s fit and look by working in half-double (Hdc) or double crochet (Dc) stitches. And by working in stripes or all in one color of yarn. 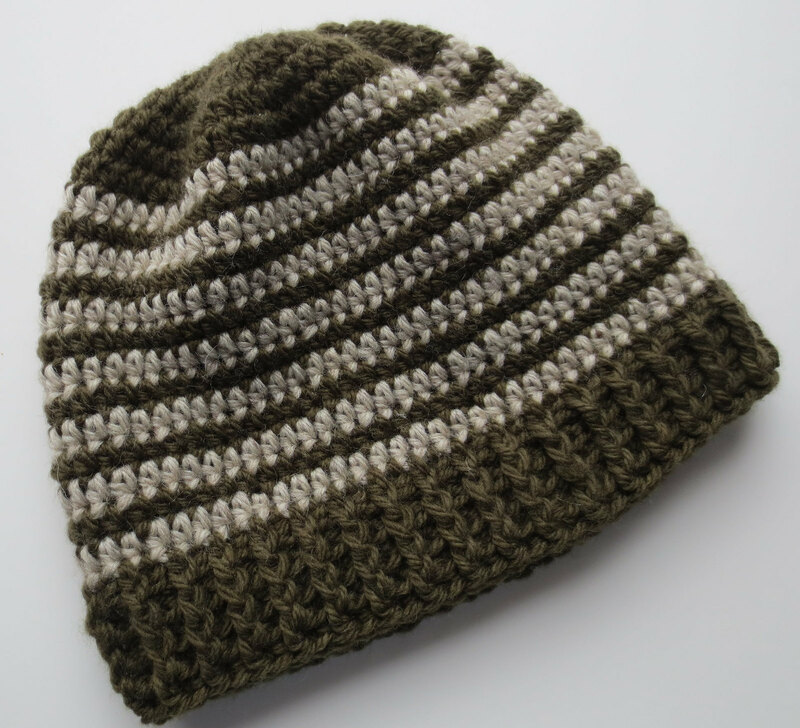 I have also included changes to crochet this hat for a child’s head size. Have fun with the pattern and as always happy crocheting to all. Children size hat instructions in italic below. With H hook, Ch 4 and join to form ring. Hat pattern is worked in the round without turning. © 2014 My Recycled Bags.com - Powered by Wordpress.